In 1711, young Henry Lloyd and his bride, Rebecca, arrived on a 3,000- acre parcel of land owned by Henry's family. The land, which was located on Lloyd Neck, (then called Horse's Neck) had been left fallow by Henry's father, James Lloyd I. It was here that Henry decided to make his fortune. Since the Lloyds were Episcopalian gentry and owned a flourishing trading business in Boston, Henry already possessed the wherewithal to establish a manor upon his arrival on Lloyd Neck. He arrived with six slaves and such valuable trade goods as Bibles and needles, and was soon able to obtain the necessary labor to build his four room Manor home in the most modern mode of the day, the post-medieval architectural style. To this day, the Henry Lloyd Manor House is one of the few surviving examples of this style of architecture. Henry and Rebecca immediately began their own family, which eventually consisted of ten children who survived to adulthood. They also increased the number of slaves who worked on the property, and among these was Jupiter Hammon, the first published African-American poet in the colonies. Also, the Lloyds began clearing patches of land for their extensive flocks of sheep, orchards, outbuildings (barns, blacksmith's shop, school, cemetery, etc. ), and farms. In addition, Henry rented land to tenant farmers from whom he collected annual quitrents. After a short time, the Manor became self-sufficient. Lloyd Harbor was a part of Henry's manor. Fishing and duck hunting in Lloyd Harbor earned fees for Henry. So did hunting on the land, horse grazing, and trapping. The magnificent stands of oaks and chestnuts provided superb masts for the sailing ships of the British navy or colonial trading ships. Henry's ability to import apple trees enabled him to turn his prolific crops into apple cider and to earn him a considerable sum from his extensive apple cider trading business in the other English colonies and in the Caribbean. The Manor also contained fecund salt and fresh water ponds and enough grazing land to support the large variety of animals needed to supply meat, hides, wool, candles, powder horns, bristles for brushes and plaster, etc., for the Manor and for trade. Together, the natural resources of Lloyd Neck, coupled with the ability to import/export goods, enabled the Manor to flourish under Henry's guidance. When Rebecca died, Henry married a widow with children of her own. When Henry died in 1763, he left the Manor to his four surviving sons, Henry II, Joseph, John and James. 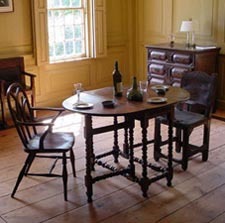 The sons received unequal portions of the Manor from their father. Henry had paid for James' medical education in England, and James became the first obstetrician/pediatrician in the colonies. Noting the cost of James' education, Henry justified his decision regarding the unequal property subdivision. Nathaniel, the son who had pre-deceased Henry, had left only a daughter as a survivor. Since women could not inherit land without it becoming the property of their husbands, Henry left his daughters and granddaughter a sum of money.